By Lawrence Cheung, Chemistry co-editor. A lot of work goes into making a good meal. You have to plan what you want to eat and then you have to gather the ingredients. Cooking the food is the part that can make or break a meal, but with a little insight into molecular gastronomy, meal preparation can be a breeze. The term molecular gastronomy was invented by chemist Hervé This and physicist Nicolas Kurti to promote their cooking workshops dealing with the physics and chemistry of cooking. But molecular gastronomy has far broader implications and deals with whatever concerns a person’s nourishment, including the physical and mental senses that determine how we taste and perceive food. In this post, I am sharing the results of a two-course meal I prepared in my own kitchen using simple molecular gastronomy techniques. The featured main is a pan-seared ground Angus beef burger with a side of French fries, and for dessert I made a mango fruit tart topped with a fruit juice caviar. To me a good hamburger is well seasoned throughout, has a good sear on both sides and is juicy in the centre. The benefit of making a burger patty from fresh ground meat is that you can incorporate any seasoning you want evenly throughout the burger. 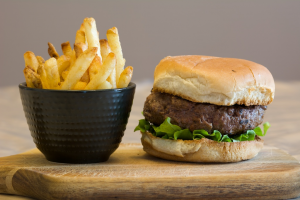 As a minimum, I seasoned with salt and pepper and created a five-ounce patty that was roughly one inch thick; this is a good size burger that requires about 2–3 minutes of cooking per side. You want to cook your burger in a preheated, hot pan; this will create a nice sear and, in the process, kill surface bacteria, impart flavour and create the desired crust. Forming a crust prevents juices escaping and leaves the centre tender because it is less cooked. The burger requires only one flip—don’t agitate the burger during the cooking process. If you do, you increase your chances of breaking apart the patty or opening the crust and letting the precious juices escape. In contrast, cooking a burger on low, gradual heat requires a longer cooking time, giving the juices the opportunity to escape and leaving the centre dry and tough. 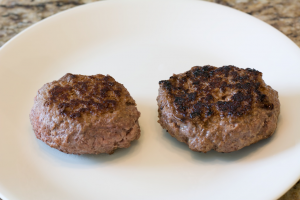 I prepared two burger patties; one cooked with slow, gradual heat (left) and the other on a high heat (right) and I asked my wife to participate in a blind taste test. Two burgers cooked with different levels of heat. French fries are the perfect complement to a burger and potato preparation is the key to making tasty fries. First it is important to cut the potatoes into roughly equal-sized pieces to maintain an even cook on each fry. Then you need to wash off excess starch from the potatoes and dry them. Excess starch will burn in the hot oil; this turns the oil dark and imparts a burnt flavour to the fries. If there is excess water on the potatoes it lowers the temperature of the oil. But more importantly the excess water will evaporate immediately and spatter hot oil during the cooking process, which is a safety concern. The magic temperature for cooking French fries is 180°C. If the oil temperature is higher then the potatoes can burn; a lower oil temperature will require a longer cooking time, which allows the oil to penetrate the fries leaving them greasy. I don’t have a deep fryer so I fried the potatoes in a shallow pool of canola oil in a pan and I discovered that pan frying causes a bit of uneven cooking. The surfaces of the potatoes that touch the pan cook faster because they are closer to the heated source–something to keep in the back of your mind if you are going to use a pan to make fries. To finish, I like to add a bit of salt to the fries right after they have been removed from the oil, which helps bring out their flavour. Fries and burger cooked with molecular gastronomic techniques. For dessert, I made a mango tart topped with fruit juice caviar. The pie crust was store bought and baked according to the directions on the package. 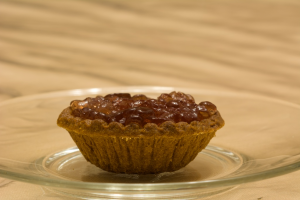 The tart filling was made by lightly sautéing some diced mango in butter with a sprinkle of sugar. This was the first time I had ever attempted fruit juice caviar. I combined one cup of apple/grape juice with 14 grams of plain gelatin powder and brought the mixture to a boil in a small pot. The juice mixture was then removed from the heat and immediately drawn up into a syringe. I used the syringe to dribble droplets of the juice mixture into a glass containing canola oil that had been cooled in a freezer for three hours. Adding the juice mixture to the cold oil forms the caviar. Gelatin powder is the active ingredient that creates a jelly texture after it has been dissolved and cooled and it is the same ingredient found in Jell-O powder mixes. The caviar was removed from the oil after 5 minutes and placed in a strainer so that the excess oil could drip off. The fully drained caviar was placed on top of the mango to finish the dessert. 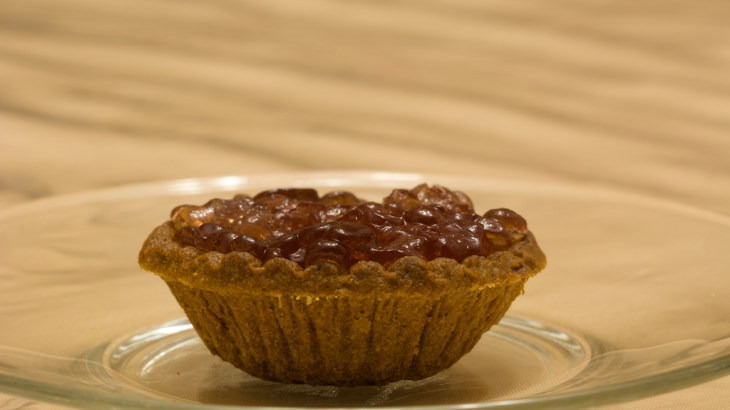 The tart tasted good, but adding a bit of sugar to the fruit juice would have helped. I discovered that using a narrow glass container to hold the oil contributed to individual caviar beads sticking together to form a single congealed gelatin blob. A solution is to use a wide dish to hold the chilled oil, and add the juice mixture in a single layer of droplets so that they are not on top of each other—that way you will end up with individual caviar beads. Molecular gastronomy not only deals with cooking food, but it can be used to fool people’s senses when they see food. It’s food twists like this that create an experience that goes beyond our taste buds. The beauty of fruit juice caviar is that it resembles real caviar. Imagine if fruit juice caviar were used as a substitute for real caviar in a sushi dish. If someone were to look at such a sushi dish they might assume that the fruit juice caviar was real caviar, but they’d be in for a surprise when they tasted it! We can use our knowledge of science and food to create all sorts of culinary delights that throw curveballs at our senses. All that is required is some time, work and imagination. Chemistry chemistry of food, food, food science, Lawrence Cheung, molecular gastronomy. permalink.